On Tuesday, February 5, students arrived at Leesville Road High School in the morning to the sight of various news crews parked in front of the school and police officers roaming the halls. Leesville officials have taken extra safety precautions in response to a threat made against the school on Monday. On Monday night, Leesville administrators sent an audio message in an email to parents once the school learned of a threat publicized on social media. A picture spread around on social media platforms Monday afternoon of a handwritten threat on a bathroom wall, reading “DONT COME TO SCHOOL 2-5-19 — 2-10-19. 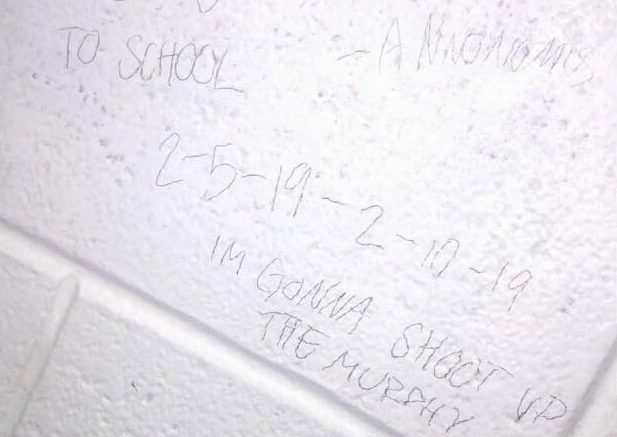 IM GONNA SHOOT UP THE MURPHY,” signed by “ANNONOMUS.” The threat refers to the Murphy building on campus. Assistant Principal Kate Fehling said in the message that the school notified Wake County security officials and the Raleigh Police Department of the threat immediately to open an investigation into the matter. Wake County security personnel and an extra police presence will remain on campus while officials conduct the investigation. Fehling went on in the message to state that school safety remains a “top priority” and that any student with information should be sure to report it to the proper officials. “These actions are not to be taken lightly. Any student with information about this crime should contact school administration or law enforcement immediately,” said Fehling. Students can also report information by calling the Wake County anonymous tip line at (919) 856-1911. Be the first to comment on "Increased security at Leesville on Tuesday in light of threat"